Firstly, my apologies for such a break. Prioritising to get in here is something I will master. I began with a long post to try and set the scene and define leadership in some way as I’ve seen it and where any leadership would hopefully lead us – encouragement to act. Simple. I prefer a starting point back one step here in leadership in it’s simplest form. John Quincy Adams’ quote whilst spot on, talks about the ‘results’ of acts of leadership. I prefer, as I seek to get myself right, as all leaders do, to see any action, no matter who is watching or who I may lead or inspire, as either leadership worthy, or not. It’s where it all starts and until we hold ourselves accountable and see the unseen as leadership, I believe we’re pretending. 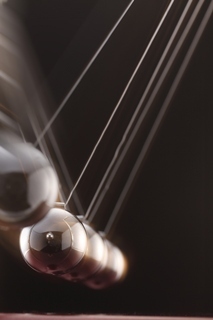 As in Newton’s cradle above, all of these thoughts, actions, and subsequent habits must impact ourselves further internally and others in some way. There is no stopping that, the balls that are released, impact the others. Just as our actions do. They will impact ourselves and others, they will either inspire and be worth ‘copying’ or they won’t.